Park and Recreation officials met Monday night with neighbors to discuss renovation plans for the West Charlotte Recreation Center. The roughly $1 million project is likely to close down the center from late spring to roughly December 2015. It will be the first major re-do of the heavily used facility since it was built in the early 1960s. Lee Jones, Park & Rec director of capital planning services, outlined the history of the project and introduced other staff. Steve Sweat, the project manager for this renovation, gave a brief overview, and Daniel McNamee, an architect with consultant Neighboring Concepts, discussed details. Contact details of the officials present are below. As explained by Jones, a key factor in the renovation, and a major portion of the cost, goes to bring the 1963 structure into compliance with building codes and handicapped access rules, and to replace or renovate aging ventilation, plumbing and other “bones” of the buildiing. The recent roof work will not be disturbed, and Sweat said that about $40,000 in scheduled routine painting and maintenance that would have been ruined during construction has been delayed, with the $40,000 saved added to the renovation budget. Doubling the size of the multipurpose room currently used by the Forum, by removing the kitchen and combining it with the smaller room behind the kitchen. A movable wall would allow the space to be used by two groups simultaneously. Enlarging the fitness room off the gym, reorganizing storage and re-flooring the gym. 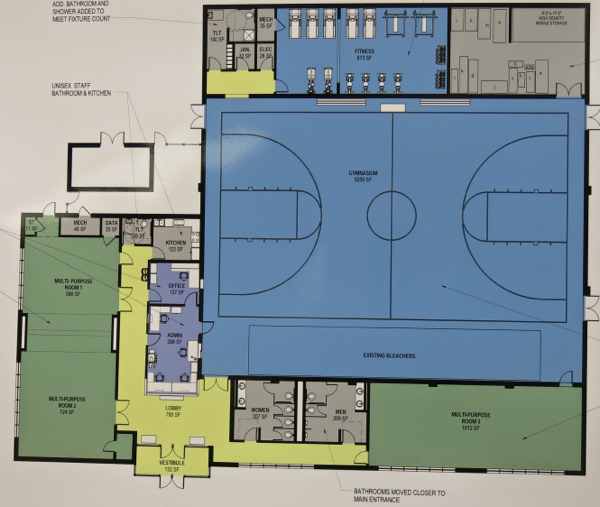 Enlarging the room adjoining the gym that currently houses an afterschool program so that the room could accommodate visits by a class of 30 students. The expansion of this room appears to be the only movement of exterior walls now planned. 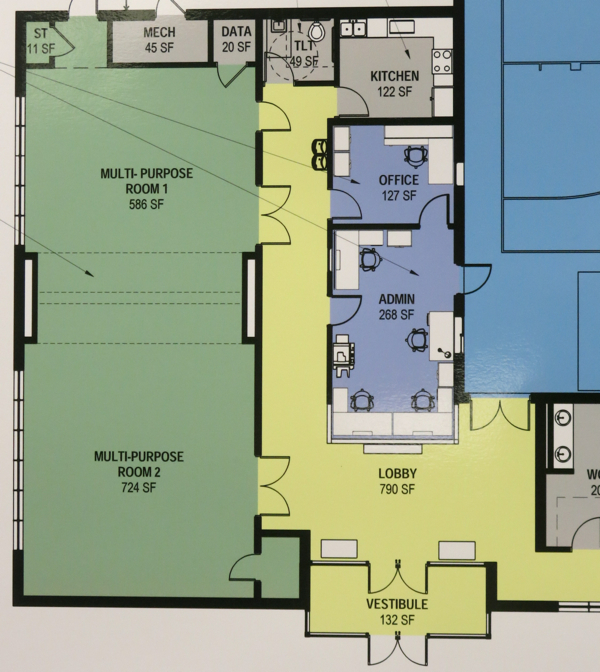 Most of the restroom facilities would be relocated to space off the lobby. 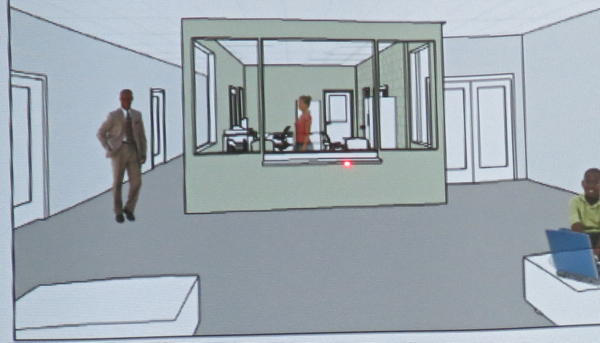 Extending the office area into the lobby, using glass to allow staff to monitor building use, adding a private office, relocating and upgrading the kitchen. Heavy rains overflow the storm sewer by the entrance, with rainwater entering the building, they said. Sweat said the county was exploring whether the stormwater pipes had become clogged or were undersized. A sinkhole has opened up on the parking lot. The existing hole has been covered, but the hole remains visible. A resident said the hole has been growing for two years. Asked when construction would occur, Sweat said construction would not affect election precinct use of the building in November; would begin in the late spring; would probably require the Board of Elections to relocate the 2015 voting for the precinct; and wrap up late in 2015. Parents let off or pick up children not on the parking lot but at the front door, clogging Kendall Drive and putting children at risk, a resident reported. Jones responded that Park & Rec will consider ways to reduce congestion on Kendall. W. Lee Jones, Park and Rec division director of capital planning services; 704-336-8466 or by e-mail. Tim Turton, Park & Rec chief horticulturalist; by e-mail. Heidi Kitterman, regional director for north region facilities; by e-mail. Calandra Barnes, former facilities manager at West Charlotte Recreation Center; 704-353-1236 or by e-mail. Tari Cottman, newly hired facilities manager at West Charlotte Recreation Center; 704-432-6474 or by e-mail. Daniel McNamee, architect; by e-mail. Maria Floren, designer; by e-mail. Darrel Williams, principal; by e-mail. Green area marks where existing kitchen will be removed, creating larger room for community groups like the Forum to meet. Lobby area, with desk removed and office walls pushed out. Fitness area now ends at wall that will be opened into old restroom area. 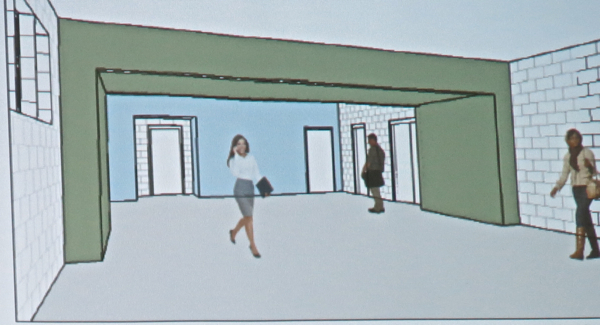 Combining multi-purpose rooms in green will create a space twice the size of the Room 2 now used by the Forum. 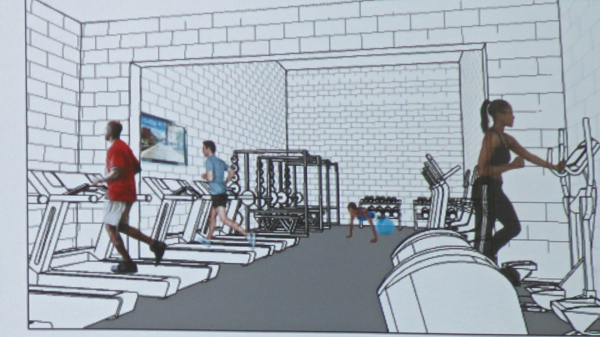 Fitness room at top, in blue, takes over space devoted to showers. Patio area behind cruciform brick wall will become part of the building, allowing larger restrooms and a second large multipurpose room.